As some of you will be aware, American thriller writer Jeffery Deaver has been tapped to continue the literary adventures of Britain's most famous fictional spy, James Bond. Today there is a great article in USA Today where Carol Memmott talks to Deaver about how he, someone who "looks more like a brainy villain in a James Bond movie than a '00' agent in Her Majesty's secret service" got picked to breathe new life into one of the world's most famous fictional characters. Deaver also reveals a few snippets and hints about the next Bond book, to be released in May next year. You can read the interesting article in full here, and also watch a video of Deaver above. Hat tip to Bookman Beattie for the heads-up about the great article. 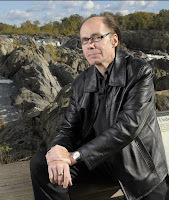 What do you think of Jeffery Deaver writing the next James Bond book? Are you a Bond fan (books or movies)? Do you like Deaver's Lincoln Rhyme series, or other novels? What do you think of continuing series once the original author has passed on? I like Jeffery Deaver's books but he doesn't immediately strike me as an obvious choice to carry on the James Bond series. Admittedly, I haven't read Ian Fleming's books only seen the Bond movies so maybe his style is more suited than I realise. I'll certainly be curious to read Deaver's take on the iconic spy. I simply do not read such books. As far as I'm concerned once an author has died their work is finished and their characters and settings are done with. So I won't be reading any of Deaver's Bond books even though I quite like his Lincoln Rhyme novels.